As one of the leading car accidents claims management companies in the UK, we can offer immediate and expert legal advice for UK residents looking to claim for car crash compensation. Call us today on our Freephone number for a no win no fee* personal injury consultation on car crash claims 24 hours a day, 7 days a week to discuss your injury and accident. Make a Car Accident Claim No Win No Fee* – Our team are available 24 hours a day to speak to you about your car accident claim. If you would like a no-obligation discussion about compensation then please call our Freephone number. You will immediately talk to a specialist who will assess your claim and talk to you about the various options available to you. At Friends Legal Limited we have years of experience in helping UK drivers to claim for the maximum amount of personal injury compensation possible for their injuries and accident. We work on a very simple basis, which is designed to ensure that our clients receive the best possible car accident claims advice and receive the very best legal representation from our expert car accident solicitors. This is how our process works when you phone us to make a car injury claim. If you have been involved in an accident and were injured then call our number now. You will talk to a car accident advice specialist who will ask you a number of questions. If our specialist feels you have a claim that will lead to compensation, you will be transferred to one of our partner lawyers local to you. Our lawyers and solicitors will work on a no win no fee* agreement for you. Over last decade we have helped hundreds of claimants to successfully win personal injury claims. Many of them have got in touch with us due to our car accident claims calculator and how we work. Here is just a short selection of some examples where we have helped people living and working in the UK. In our first example case, our claimant was offered just £75 in car crash claim compensation insurance from the insurance company of another driver who crashed into his lorry. Our solicitors took the case on and ended up winning a four figure sum personal injury award for the client. In this case you can see that it’s not always a good idea to accept an insurance pay out before you speak to our team. In a more recent example, our client was shunted from behind with such force that she suffered a serious whiplash injury. She called our team to discuss a claim for a car accident and received immediate payments to help finance physiotherapy medical costs. In this example it just goes to show the worth in claiming after a car accident for your injuries. If you have been involved in a similar scenario then you can read more about our whiplash claims process here. The UK’s roads are comparatively safe when compared to many other countries both in Europe and the rest of the World, but accidents unfortunately still do happen – and when they do, they can sometimes be devastating for those involved. We offer some of the best car accident claims advice for car crashes in the UK, so make sure you speak to us if you need advice. What follows is some information on statistics for the UK which we hope serves as a timely reminder on the risks involved in driving on the nation’s roads. Statistics on UK accidents – image courtesy of the excellent CuteInjury.co.uk website. In addition to the excellent image shown above, the ROSPA website has also released information on accidents that have led to car crash claims in the UK. The following information is also taken from 2012 – we will update our website when new information becomes available from the UK government. According to ROSPA, not all accidents are actually reported leading to car accident claims, so these numbers are actually going to be much higher than the ones that have been reported to the UK police force. The following list of examples where can help you to make successful car accident injury claims is by no means exhaustive, but gives a good indication of the type of car crash claims that we have covered, or can cover with new claimants. Due to the speeds and risks involved on the UK’s roads and motorways, vehicle accidents can lead to a wide variety of injuries, ranging from the minor to the serious. If you read the examples below you will see that there are certain types of injuries that are more common. Brain Injury and Head Injury Car Accident Claims: Being involved in high speed vehicle crashes can lead to closed head injuries. This can mean anything from concussion to a more serious brain trauma accident. Many people involved in crashes might not immediately exhibit any signs of injury (for example a cut or bruise) but because the brain can be shaken inside of the skull it can become damaged. We work with some of the country’s leading head injury claims solicitors and can connect our claimants up immediately as part of the procedure. We also have a new web page all about brain injury claims compensation which details some of the specifics in cases such as this. Neck Injury Claims: The neck is one of the most common parts of the body that is affected by a car accident injury claim. Many claimants who call us will have suffered from whiplash or neck strains, but can also be affected by more serious injuries such as disc damage or cervical radiculopathy. For more information on how we manage car injury claims of this type then please view our neck injury compensation page. Back Injury Claims: Most claims will occur at high impact speeds. Because of this, the pressure on victim’s backs can be very severe, leading to injury types such as fractures, strains, sprains, disc injury, spine injury, lumbar spine injury, lumbar radiculopathy, and thoracic spine injury. As we discussed above about neck car crash claims, back injuries cannot always be apparent immediately. Victims will often not experience any pain in the immediate aftermath of a crash, but instead suffer days, weeks, months, and years into the future. Because of this it’s imperative that you let us help to arrange a medical consultation as part of our back injury claims process. Facial Injury Claims: Car accidents will often lead to injuries to the face area. This is due to flying glass, impact with a steering wheel, airbag impact, seats, and more. An injury to your face could be a cut, bruise, or breaks and fractures. Many claimants have also suffered from jaw fractures – and we’ve been able to assist them in claiming for car accident injury claims in most cases. Psychological Injury Claims: Being involved in a road accident and crash can be a very frightening experience, and many people will develop psychological injuries that can remain for the long-term. These should be considered just as harmful as physical injuries, and we take emotional distress very seriously. That’s why we have a group of car accident lawyers who are ready to support in case such as this. They are specialists in helping with post-traumatic stress disorders, and other psychological conditions arising from a crash or accident. Call us today for advice on how to proceed to claim for compensation or get expert support and UK accident claim advice. 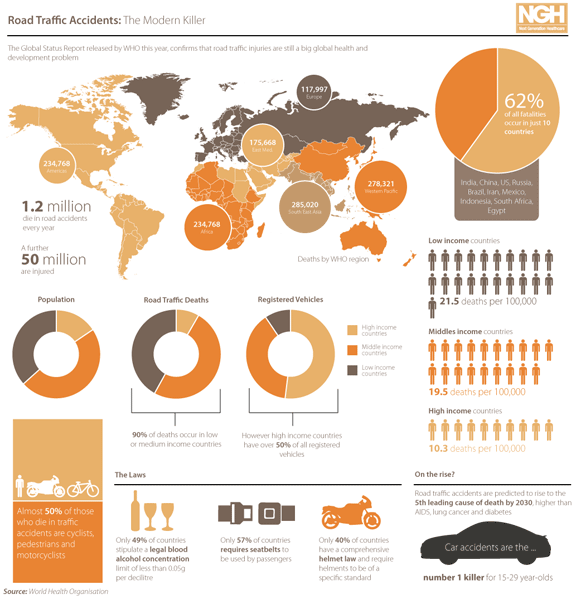 Global statistics on road accidents from the World Health Organisation leading to claims. If you have been injured in a road accident and need advice on what steps to take then please follow our easy to read guide that we have set out below. If you have been involved in a car accident, and it was not your fault, and a third party was responsible, then it is very likely that you will be able to claim for car crash compensation. It doesn’t matter whether or not you were driving, or were a passenger, or perhaps even a pedestrian (click here for pedestrian accident claim advice), you might be able to take car accident claims advice from our solicitors. They will advise you on how you can claim back medical expenses, lost income, and any other financial losses that can be attributed to the crash. To stand the best chance of receiving the maximum amount possible for a personal injury claim then our advice is to take the following steps immediately where possible to make the strongest case for a personal injury claim. This is where many people lose out as the car accident claim process is made a lot simpler if the police know about it. Whilst in serious cases, the police will always be present, in minor accidents, some potential claimants fail to call the police. By having a police log of the incident you stand a much better chance of being able to claim for personal injury compensation. This means that you will be able to get an official copy of the police report which will have all of the essential details in it that our solicitors will need in order to pursue your car injury claim successfully. In most cases, the report will state who was responsible for the crash which is an essential part of the legal process. Where possible take notes about the incident, including as much information as is humanly possible. Some aspects to the accident might not seem important at the time, but small details can sometimes be the difference between winning and losing a car accident claim. Also make sure you hold on to any receipts from payments or expenses that may have been incurred. Some people who we have represented on a car crash injury claim have even keep diaries immediately after the accident. This would include trips to the doctor, hospital visits, and phone calls with their employer or other related contacts. By tagging receipts to each entry you can also keep a fantastic log which could lead to an increased compensation amount. During the claims process we also advise that you keep a record on how you are feeling from an emotional perspective each day. As we have stated elsewhere on this page, psychological damages can be a key part of any personal injury claim in the UK. This can help to make your case a lot stronger, and could mean an increased compensation amount for any accident claim that you make with us. This is the point that you would need to call our helpline. Our advice is that in the immediate aftermath of a car accident, you seek accident claims advice. By talking to us we can assess your claim and then pass you onto a personal injury solicitor local to you who is an expert in claiming for accident injury compensation. The reason that we advise you seek legal representation for your claim is for a number of different, but all valid reasons to have a personal injury solicitor. For example, by having our experts at your side, it’s unlikely that the concerned car insurance companies will dismiss you with a derisory initial offer, which they will hope that you accept. Many insurance companies attempt to settle out of court quickly with smaller compensation amounts. You might think this sounds good at the time, but our experience tells us that you should never settle for this. With our personal injury solicitors at your side, and representing you, there’s every chance that you can receive a far higher payout amount. Not only that, but by using our services and solicitors, they will know exactly what to present, how to proceed with your case, and set you up to get the most from your claim. So please don’t delay, and call us as soon as you can for immediate and expert advice. We hope that you find our advice useful and call us to discuss your claim. We have also put together a short list below of related support websites that are excellent at helping and assisting victims of road accidents.